Hi friends! 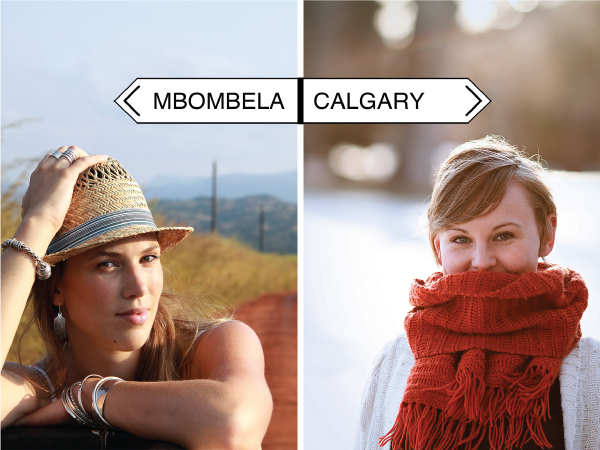 We are really excited to be launching our blog from Calgary and Mbombela. For our first post it seemed fitting to give you a small glimpse of us and our cities. We were both born and raised in Calgary (cal-gree), a sprawling city located at the edge of the Canadian Rockies best known for oil, snow and cowboys. Two years ago, Charlotte did a graphic design internship in Mbombela (m-bom-bay-luh), a small South African city previously known as Nelspruit, about 300 km east of Johannesburg that serves as a gateway to Kruger National Park. She fell in love with the lifestyle, the people, the sunshine and a boy, and has been dividing her life between the two cities ever since. This blog will be used to explore these two places and bring our lives closer together. Thank you so much for stopping by. Leave us a note, follow us on twitter and check back often, we can't wait to share our project with you! We have to thank our photographers Murray and Luke for putting up with us. We are both awkward in photos and they made us look so good! Also, John Holloway for help with writing and editing. Check out their work, we honestly know the best people. You both look beautiful in this picture! I look forward to your upcoming posts! Look forward to checking it every day! Excellent job....very proud of you both!